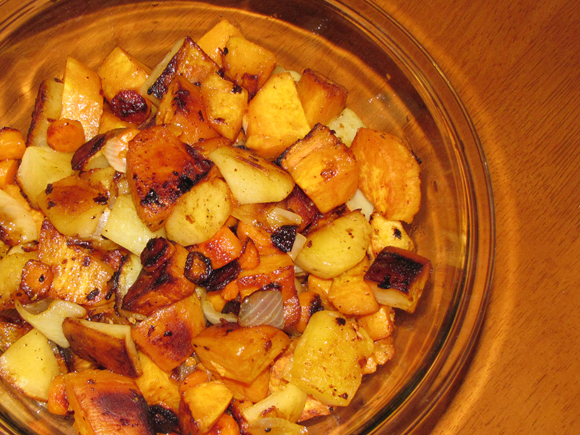 In my opinion, there's not much out there that's better than roasted vegetables. And if those vegetables are root vegetables, then you're in for a real treat. Root vegetables are different than the others because they carry more natural sweetness than their over-the-ground counterparts. Natural sweetness means you can cook them until the vegetables are sweet and tasty and just oh so good. Add in some garlic and it's elevated to amazing heights of flavors that burst in your mouth with every bite. 2. Mix oil, garlic and spices together. 3. 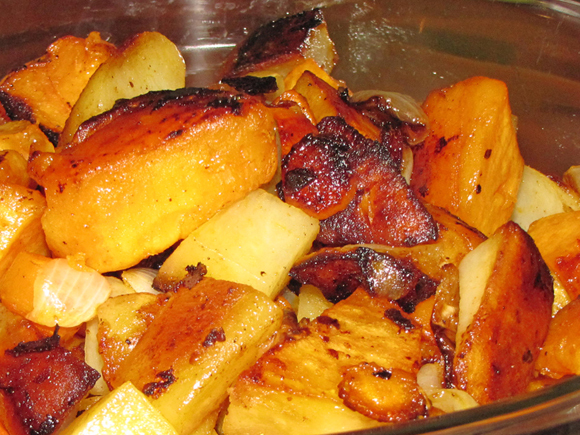 Cut sweet potatoes into 1 1/2" dices. 4. Cut idaho potatoes and carrots into 1" dices. 5. Cut onion into 1" chunks. 6. Toss oil mixture with vegetables. 8. Bake for about 40 minutes or until tender and browned. Mix them around and turn pieces over halfway through to ensure even cooking.